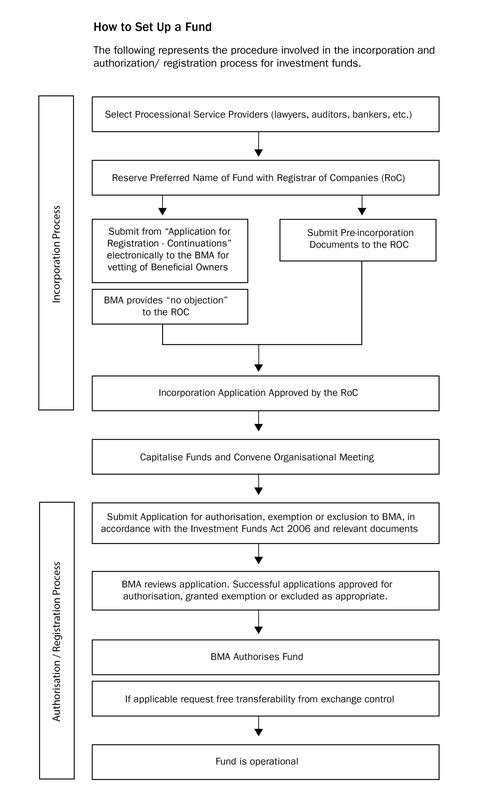 The following represents the procedure involved in the incorporation and authorisation process for investment funds. The following information outlines the requirements for Authorised and Registered Funds. A partnership fund means a fund under which the property is held on behalf of participating partners of the partnership registered under the Limited Partnership Act. A limited liability company fund means a fund under which the property is held on behalf of the members of a limited liability company formed under the Limited Liability Company Act 2016. An Investment Fund may make use of the Segregated Accounts Companies Act 2000 and take the form of a segregated accounts company. See the Investment Fund Guidelines for detailed provisions regarding certain requirements applying to funds making use of this option. What funds are in scope of the Investment Funds Act 2006? Mutual Fund Companies, Unit Trusts, Partnerships and Limited Liability Companies that meet the definition of an Investment Fund as stated in the Act must apply to the Authority to either be Authorised or Registered. Institutional Funds are targeted essentially at institutional/sophisticated investors and are restricted to qualified participants or those investing at least $100,000. They are required to have an officer, trustee, or resident representative in Bermuda, being a person who has access to the books and records of the fund. a particular law, or particular set of laws, of such jurisdiction as applicable to such fund. The fund must also satisfy the requirements set out in the Investment Funds (Specified Jurisdiction Fund) (Japan) Rules 2012. A fund qualifies as a Standard fund if it does not fit within any other class of fund. Such funds are not restricted to sophisticated investors and may include a more significant retail element among their investors. Consequently they are subject to more comprehensive regulation and supervision. Funds are considered Private under the Act if the number of participants does not exceed 20 persons and the fund does not promote itself by communicating invitations or inducements to the public generally. An Investment Fund, which satisfies the criteria set out in section 6A(2) of the Act, may apply to the Authority to be registered as a Professional Class A fund while an Investment Fund which satisfies the criteria set out in section 7(2) of the Act may apply to the Authority to be registered as a Professional Class B fund. any such other GAAP as the Authority may recognise. All Authorised and Registered funds are required to satisfy Proceeds of Crime (Anti-Money Laundering/ Anti-Terrorist Financing) Regulations 2008. As such, the Authority may require the fund to file AML/ATF information disclosing the contact details for the Compliance Officer and Money Laundering Reporting Officer, along with a copy of the Board approved AML/ATF Policies and procedures.